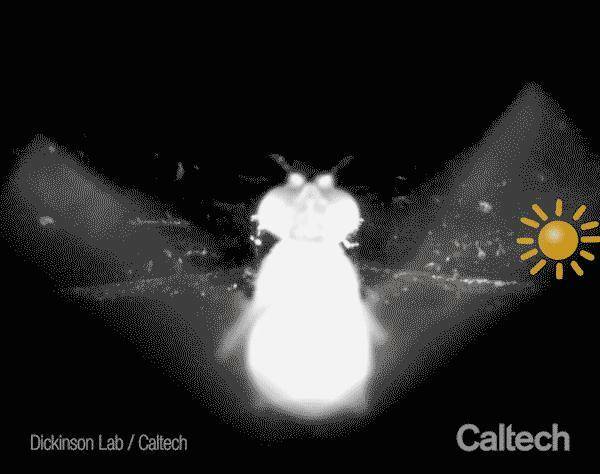 Fruit flies may have tiny brains about as big as poppy seeds, but their noggins are complex enough to the remember the Sun’s position to help with navigation, according to a new study in the journal Current Biology. Without these special compass cells in their brain fruit flies, known as Drosophila, would end up flying endlessly in circles. They aren’t the best fliers around, but an old experiment from the 1980s found that Drosophila can fly nearly 15 kilometers - over nine miles - across Death Valley in a single evening. "For flies crossing inhospitable territory, flying around in circles would be really dangerous - they're less likely to find any food or water," said Ysabel Giraldo, first author of the paper and a postdoctoral scholar at the California Institute of Technology. "Surprisingly, fruit flies are seasonally found in environments like the Mojave Desert. They must get there from somewhere, and once there, they must figure out how to get around." The researchers conducted experiments with a ‘flight simulator’ - basically a box covered with a series of LED lights. When one of the lights was turned on, the flies orientated their bodies towards it and began flapping its wings. They switched off the light and turned the same one on and found that the critters could still remember the same position hours later. A fruit fly in the 'flight simulator' beating its wings. Image credit: Dickinson laboratory. To see whether it was down to compass-like cells in their brains, the researchers modified neurons that fluoresce if activated. Next, they carefully poked a tiny hole into the flies’ heads and used a microscope to discover that the compass cells were stimulated when the insects started flying. "It was a bit surprising to find that the same pesky little flies that flit around fruit bowls and wine glasses have the capacity to navigate for many miles using the sun," said Michael Dickinson, co-author of the paper and a professor of bioengineering and aeronautics at Caltech. The team hopes to study the compass neurons in more detail to find out how fruit flies retain memories and use the sun to navigate.